Hello! 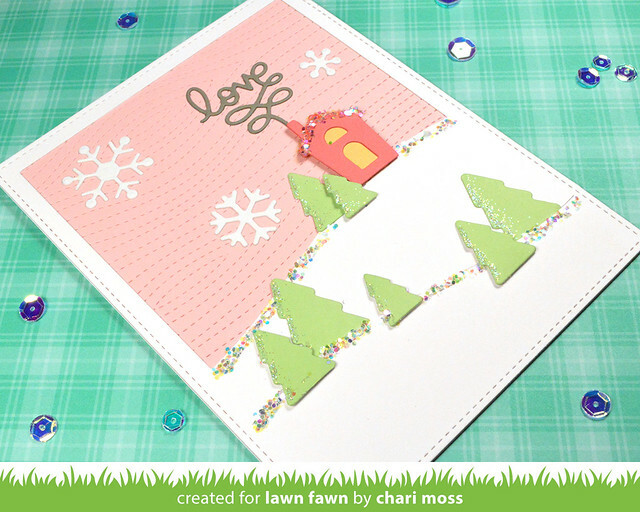 Welcome back for another day of Lawn Fawn Inspiration Week! Today we are using the new Stitched Hillside Backdrop Dies. These dies cut the hills and the frame all in one pass through the die cut machine to make for easy scene building. There are also lots of other fun elements like trees and houses to use. These dies come in both landscape and portrait orientation and the extra elements included in the die set are different for each one so you never get a repeat die shape. My first card today uses the Landscape Stitched Hillside Backdrop. 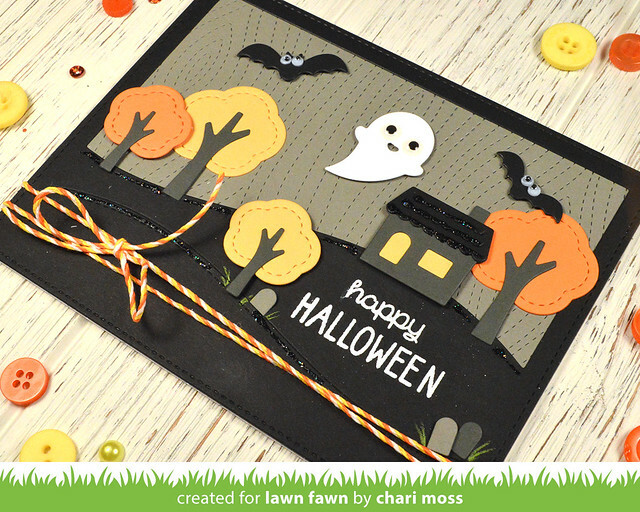 I created a spooky halloween scene using the elements in this die set. I cut a background piece from Narwhal cardstock with the stitched woodgrain backdrop for my sky and layered the stitched hillside piece cut from black licorice over top. The house and tree trunks are cut from Storm Cloud cardstock and the tree tops are from Sunflower and Fake Tan cardstock. I also added some bats and the ghost from the Scalloped Treat Box Spooky House Add-on die set with some googly eyes of course. The little tombstones are the left over pieces from cutting out the house. 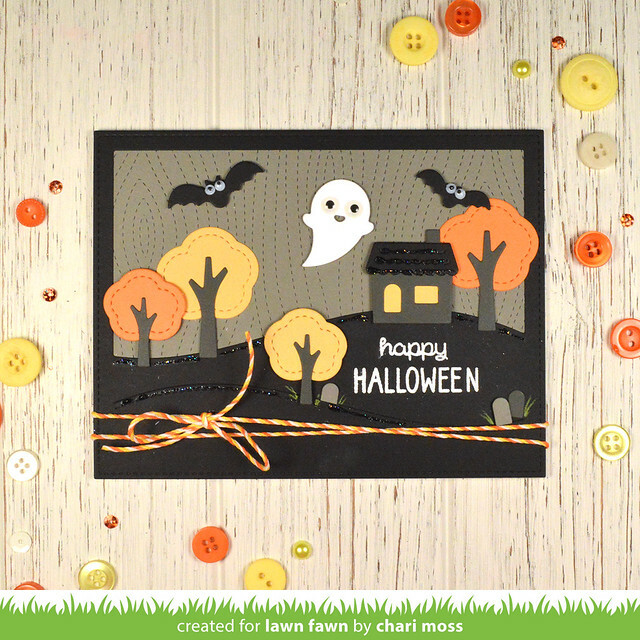 I thought the size of them worked perfectly with this little scene and I finished my card with some black diamond stickles embellishment and some candy corn lawn trimmings twine. 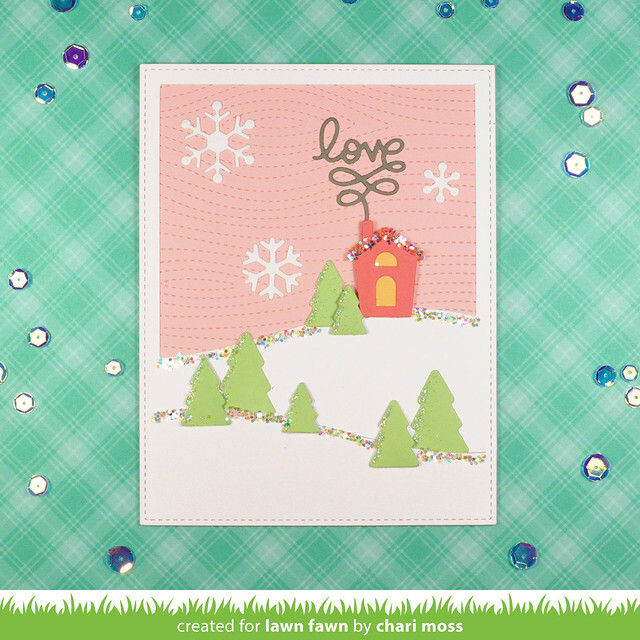 The Portrait version of the Stitched Hillside Backdrop has more wintery elements so this card had to be winter. I started with a Stitched Woodgrain Backdrop cut from Ballet Slippers cardstock and layered over it the Stitched Hillside Backdrop in white. I cut the house from Guava cardstock and the trees from white cardstock inked with Celery Stick ink. I wanted to have a nice soft green to go with my pink & white winter color scheme. I added some snowflakes and both prisma and chunky glitter to the trees, hillsides and house. Be sure to check out the Lawn Fawn Blog for more projects using the Stitched Hillside Backdrops. Thanks for stopping by today! These two cards are absolutely sweet and beautiful ! Your cards are darling!! So cute!! Love Lawn Fawn!